Culture has become a weapon of war and a fundraising tool for violent extremist organizations across the Middle East and North Africa (MENA). Millions of archaeological, historic, and religious sites in the MENA region are under threat from organized plunder or destruction from armed conflict and violent extremist organizations. This lecture will discuss how the illicit trade in antiquities is funding terrorism in the Middle East and beyond and share what can be done to halt this dark trade. Deborah Lehr is the founder and Chairman of the Antiquities Coalition. She leads a diverse team of experts in the fight against the looting and trafficking of cultural heritage by organized crime and terrorists. Their work focuses in the Middle East and Asia. Deborah also serves as the Chief Executive Officer of Basilinna, a strategic business consulting firm focused on China and the Middle East. And she is a Senior Fellow of the Paulson Institute, founded by former Treasury Secretary Hank Paulson. Previously, Deborah served as Senior Advisor to the Chairman and CEO of Merrill Lynch, and was a Senior Managing Director at the New York Stock Exchange focused on emerging markets. She also was President of Stonebridge China. Prior to joining Stonebridge, Lehr was a partner at Mayer, Brown, Rowe & Maw. Deborah has also served in government, as a lead negotiator at the US Trade Representative for China’s WTO Accession, a Director of Asian Affairs at the National Security Council, and on export control and trade policy issues at the Department of Commerce. Deborah is a member of the International Advisory Council of The National Geographic Society, the Board of the Archaeological Institute of America, International Advisory Board of the London School of Economics, the Cox Business School Advisory Board at Southern Methodist University, and the Advisory Board of SAIS at Johns Hopkins University. Deborah has lived and studied around the world, including China, England, France, and Germany. Her writings appear regularly in the Huffington Post, and have been published in Foreign Affairs, the South China Morning Post, China Daily, US News and World Report, and Caixin Magazine. And she has appeared on television to speak about antiquities trafficking and about China. President Larry Millstein called the 2375th meeting of the Society to order at 8:10 p.m. He announced the order of business and welcomed new members. President Millstein presented a summary of the 36th meeting of the Society, held in 1872. The minutes of the previous meeting were read and approved. President Millstein then introduced the speaker for the evening, Deborah Lehr, the Founder and Chairman of the Antiquities Coalition. Her lecture was titled “Saving the Past: The Quest to Combat Cultural Racketeering”. Ms. Lehr began by inviting the audience to imagine a moment of uprising and protest in Washington, D.C. in which thieves break into the Smithsonian and loot priceless cultural and historic artifacts, not just for personal gain, but in a calculated effort to harm our society by destroying the art and antiquities we celebrate. This has become the constant reality in the regions threatened by the terrorist group ISIS, who use the destruction and plunder of historic sites and artifacts as tool of war to frighten and demoralize local populations while bringing in millions of dollars to further their attacks. 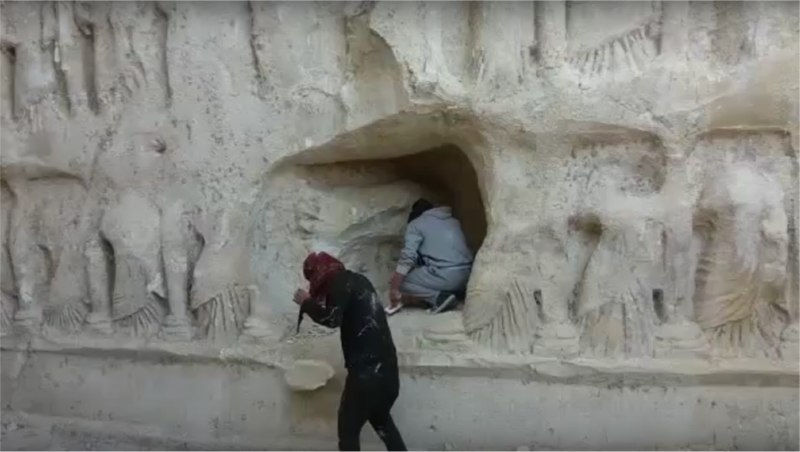 Although ISIS espouses an extremist via of Islam, the Antiquities Coalition has determined that almost 70 percent of the sites looted or destroyed by ISIS are in fact Islamic, more than the rest of the religious sites combined. Ms. Lehr explained that cultural cleansing is a precursor to human genocide, and that attacks on historic and tourists sites are intended to undermine both social unity and the local economy, both of which benefit strongly from cultural capital. Ms. Lehr recounted the story of Dr. Khaled al-Asaad, dubbed the Father of Palmyra, who curated, researched, and ultimately protected the ancient Syrian city until he was executed by ISIS for refusing to disclose the location of many of its hidden treasures. Looting of antiquities has joined oil theft and kidnapping as a top source of revenue for groups like ISIS. Although ISIS does destroy many sites, it has an institutionalized process for first stripping them of valuable art and artifacts. Records obtained by U.S. special forces and the U.S. State Department indicate that ISIS income from looted antiquities reaches 5 million dollars annually. This lucrative trade is facilitated by the fact that the United States Department of Justice has had a policy of “seize and return” for trafficked antiquities, but rarely pursues criminal charges. Attitudes may be changing, however, as the FBI has recently announced it is actively investigating and bringing charges in the trade of conflict antiquities, and the United States recently signed a bilateral agreement with Egypt to close its market to Egyptian antiquities, and other Middle Eastern countries such as Libya, Tunisia, and Morocco have expressed interest in similar agreements. Dr. Lehr concluded by acknowledging the parallels to the silver screen, in which real-life heroes battle tirelessly to save priceless antiquities, and she explained how individual collectors can help in the fight. One questioner asked whether the impending capture of the ISIS capital city Raqqa, Syria may diminish attention to conflict antiquities. Ms. Lehr explained that the very visible pillaging and destruction by ISIS was clearly a factor in creating the impetus for international cooperation, but now that these structures are in place they can be expected to continue to operate even if the focal point of the crisis shifts. Another questioner asked what, if anything, the governments of Israel and Turkey are doing about their countries’ role as hubs for trafficked antiquities. Ms. Lehr explained that Israel is cooperating with the international community in attempting to intercept looted artifacts, but has made no move to change the longstanding law that legitimizes them if they do enter the country. After the question and answer period, President Millstein thanked the speaker, made the usual housekeeping announcements, and invited guests to join the Society. At 9:37 p.m., President Millstein adjourned the 2375th meeting of the Society to the social hour.